Plan to Execute and Execute the Plan! 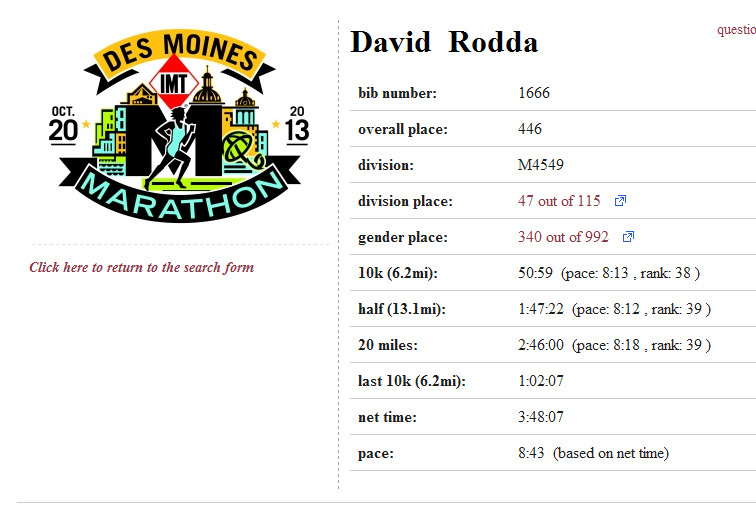 IMT Des Moines Marathon 2013 Results: Today I ran my first Marathon. What an experience and I learned more than I could have ever imagined about myself. The day was cool and I was running close to an 8 min/mile pace for much of the first part of the race. I was on pace to beat my time I set out to run up until mile 17 when my body started hinting it was not happy with me. At mile 22 both calves locked up with cramps and I went into survival mode. I was no longer running but willing my legs to keep going. After I crossed the finish line every muscle in my legs decided enough was enough. My Official chip time was 3:48:07 and I am ready for a hot bath.